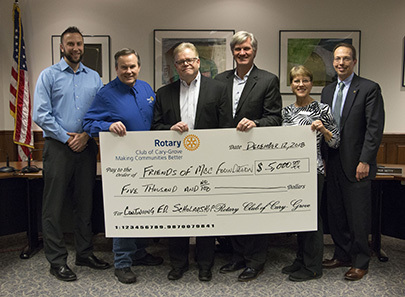 The Rotary Club of Cary-Grove recently established a scholarship for the Friends of MCC Foundation for non-credit Continuing Education scholarships to benefit Cary and Fox River Grove area students at McHenry County College. The Rotary Club of Cary-Grove recently donated $5,000 toward the scholarship. Pictured are, from left, Justin DeBolt, coordinator of Workforce Training and Professional Programs at MCC; Pat Finlon, president of Rotary Club of Cary-Grove; Dale Morton, vice president of Friends of MCC Foundation; Larry Arndt, president of Friends of MCC Foundation; Dori Sullens, director of Continuing Education at MCC; and Rob Getty, board member, Friends of MCC Foundation. McHenry County College students living in the Cary and Fox River Grove areas have an opportunity to apply for scholarships for non-credit vocational training classes, with a new scholarship program established by the Rotary Club of Cary-Grove. The college offers numerous scholarships for credit students, but this is the first time a scholarship is available for those taking non-credit workforce or professional training classes. Funding for the endowed scholarship came from Tom Decker, a founding member of the Rotary Club of Cary-Grove, who set up funds to be used for education scholarships, including those that focus on vocational training. Decker, who passed away at age 91 in November 2017, was a contractor-developer and donated land and built the Thomas C. Decker Cary Area Public Library. “We chose to start a new non-credit scholarship at MCC because non-credit certifications prepare students for a career and we thought that our vocational funding from the Tom Decker fund could be used very effectively for those programs,” Rotarian Susan Maifield said. Maifield said she was aware of the non-credit programs at MCC because she worked closely with Continuing Education while serving as executive dean of Human and Public Service at MCC from 1999 to 2009. A Rotary member since 2007, and twice past president, Maifield worked at MCC for more than 25 years. She started as an adjunct instructor in early childhood education, served as early childhood department chair/director of the Children's Learning Center and retired in 2009 from her job as executive dean of Human and Public Service, now called Career and Technical Education. “With this scholarship we try to meet the needs of people who cannot afford to take a career training class,” Maifield said. “I’m really excited and pleased that there was a short turnaround between having the scholarship ready and awarding it,” Maifield added, referring to two scholarship recipients who have been selected for spring 2019 semester. Calisa Medansky, 19, of Fox River Grove is one of MCC’s first two recipients of the Rotary Club of Cary-Grove scholarship. She received $750 toward the $2,499 tuition for the 16-week Veterinary Assistant Training class offered by MCC’s Workforce Training and Professional Programs. “It’s really helpful to me, because I have two siblings in college,” Medansky said. “Financially, I wouldn’t have been able to afford it without the scholarship. I am now able to complete the program and pursue something that I love—working with animals,” she said. The Rotary Club of Cary-Grove supports other community programs with the Decker educational funding, including awarding $18,000 in scholarships each year to six graduating seniors from Cary-Grove High School. Additionally, the club identifies three nonprofit groups to support each year. This year, the club is supporting Home of the Sparrow, Cary-Grove Food Pantry and the Fox River Grove Memorial Library. Rotary International is an international service organization, which brings together business and professional leaders in order to provide humanitarian service and to advance good will and peace around the world. Rotary International is a founding partner of the Global Polio Eradication Initiative and has reduced polio cases by 99.9 percent since its first project to vaccinate children in the Philippines in 1979. For more information about the Rotary Club of Cary-Grove Scholarship or other scholarships offered by MCC, contact the Friends of MCC Foundation at (815) 455-8721.